Vocalists (especially new vocalists) are often intimidated by what they have to learn. But, it is really not the technique that is hard to learn, it is applying the technique. Even this in itself is not hard, it just takes consistent practice. Following are three things to get you on your way to becoming a better vocalist. The most common problem amongst vocalists is how we sing our vowels. If you keep going flat on the same word every time, chances are, you need to fix the way you are singing your vowel. Following are a few examples. Save your R’s for the end. When singing a word like ‘are’, it is common for vocalists to sing the ‘r’ sound from the beginning – which makes you sound flat every time. Instead, sing ‘ah…..r’. Wait to throw the ‘r’ in there until the very end of the word. For the most part, this applies to all words that end in an ‘r’. Sing your A’s as Eh’s. When singing a word like ‘great’, it is common for vocalists to flatten out the ‘a’ vowel (gray-te). Instead, use the ‘eh’ sound (greh-te) to improve pitch and open up your vowel. It seems weird at first, but if you record yourself and listen back, you will realize how much better it sounds. Keep in mind, there are many ways to sing the same vowel and you may even sing it differently depending on the song. But, if you are having pitch problems, experiment with singing it differently as this will generally fix the problem. Most people hate the way they sound when recorded. I used to feel the same, mainly because the recording amplified all my vocal flaws. But, instead of being overly critical of myself, I decided to start recording and trying to fix what I did not like. This really is the only way to fix certain flaws. Simply put, there are things you can only hear and understand about your voice when listening back to a recording. So stop giving yourself a hard time and start recording yourself every chance you get, listening back very closely to find where things are going wrong and then finding a way to fix them. Over the past 10+ years of leading worship, my vocal range has expanded considerably. The question is, what is the trick to making this happen? Daily practice helps, of course. But the main thing that has helped me sing notes right outside my range is to first imagine myself doing it. I know, it sounds weird, but Proverbs 23:7 says, “For as he thinks in his heart, so is he.” Plus, there are numerous scriptures that reveal how powerful our mindset is. So, before writing this off, I dare you to give it a shot. Before you sing that big note, close your eyes and imagine yourself hitting it on point. I don’t recommend using this technique for notes that are way out of your range, but for the notes that are just out of your range. Then, over time, note-by-note, your range will expand. Bonus Tip: Join a community choir. One of the best experiences I have had as a vocalist is auditioning for the regional honor choir and making it through. This gave me the opportunity to sing with 120 other people who had amazing voices. Talk about being intimidated and motivated all at the same time! Being in a choir gives you experience that you could not get otherwise. You will get to listen as the choir director corrects others and hopefully spends time helping you as well. This experience will open your eyes and help you to easily diagnose problems as you improve your vocal ability. I can so relate. 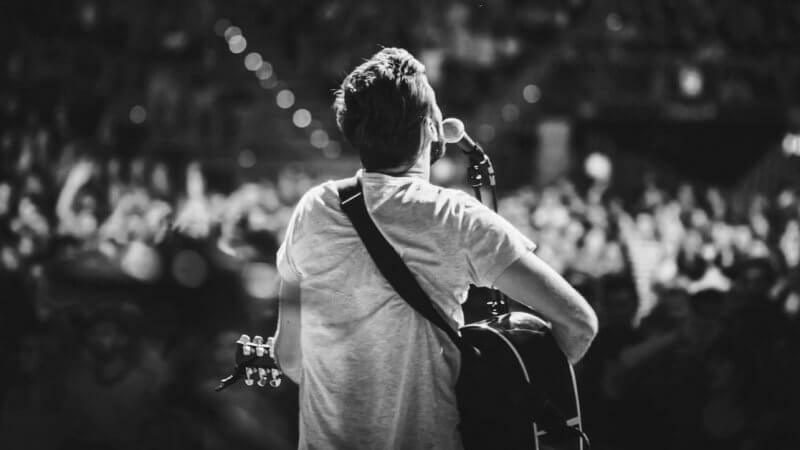 I was nervous for the first 5 years of leading worship full time…then it finally went away. Just keep pressing forward, Sherry. And, always remind yourself that it is not about you or your skill – it is all about being obedient and letting the Holy Spirit move. I lead worship at my church, I tried recording myself at home and my reaction was; is that me! That’s horrible! I sound so nasally! How can I change that? I had the same reaction when I heard myself for the first time, Sandra. Haha. Just keep recording yourself while trying to sing differently, mainly focusing on finding ways to open your throat and sing from your diaphragm/stomach. You’ll figure it out – just takes practice.